Ever since the Affordable Care Act was signed into law in March of 2010, the Republicans have engaged in a desperate campaign to repeal, stall, or chip away at the law—this campaign has included a Supreme Court constitutional challenge, dozens of repeal attempts, and resistance to implementing the law in the states. 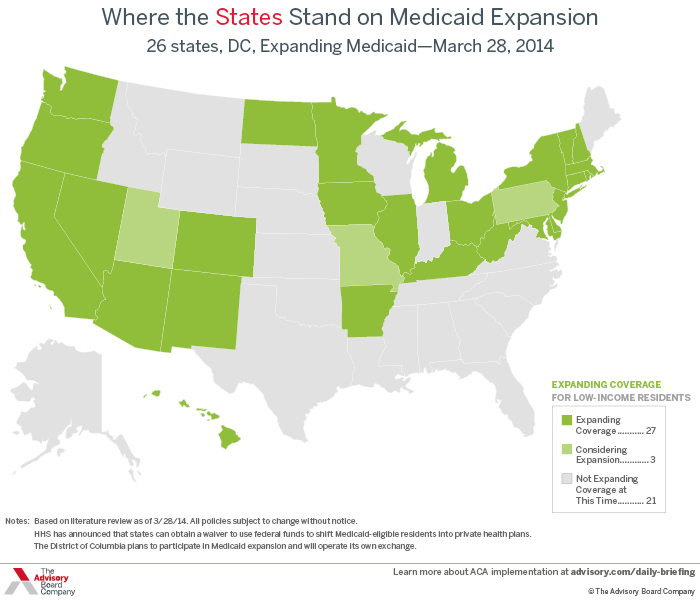 Unfortunately, while the Supreme Court decision on the ACA upheld the constitutionality of the vast majority of the law, it did result in states being allowed to refuse to expand their Medicaid programs using federal funds. This decision has allowed 24 states, all of which are controlled by Republicans, to refuse to expand Medicaid and deny millions of their constituents affordable health care. According to a new study by the Urban Institute, the refusal by these 24 states to implement the Affordable Care Act’s Medicaid expansion could cause approximately 6,000 deaths every year—these people would be dying for purely partisan reasons, in a political temper tantrum by right wing politicians who are angry that they have been unable to scuttle Obama’s signature legislative accomplishment. The deaths of these six thousand poor Americans every year can easily be put into perspective by comparing them to the GOP’s favorite issue for the past year and a half: Benghazi. 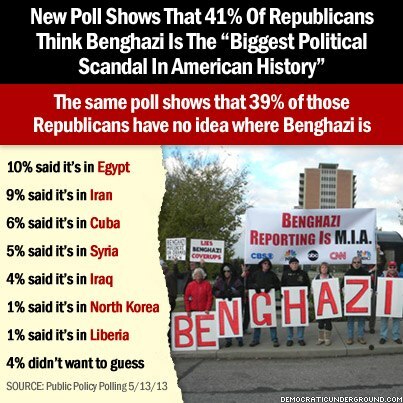 If we are to believe the right wing, Benghazi is the worst scandal in US history (a belief held by 41% of Republicans), and an example of unpardonable malice or incompetence by the Obama Administration. The deaths of the four American state department officials in Benghazi have been turned from a tragedy into an exhaustive manufactured scandal, used as an excuse to drag Obama Administration members in front of Congressional committees for circular, repetitive, and non-factual grilling. In terms of death count, the refusal to expand Medicaid by these GOP politicians is the equivalent to 1500 Benghazi raids every year—this translates to one Benghazi tragedy every six days, in each of these 24 states, continuing into perpetuity (5840 deaths per year). The Republican governors who are refusing the expansion are committing the very offense that the GOP has speciously accused Obama of—putting politics over the lives of Americans—on a truly massive scale. Each of these governors has the opportunity to prevent the equivalent to dozens of Benghazis every year with the simply stroke of a pen, yet they have refused to do so in order to save political face. If the Congress wants to investigate political maneuvering which causes the deaths of Americans, they need to start looking at these governors rather than continue beating the dead horse of Benghazi. Of course, this would assume that they actually care about dead poor Americans and are capable of assessing policy consequences detached from their hatred for Obama. Unfortunately, the GOP establishment neither cares for the poor nor has the capacity to see beyond their hatred. They have turned Benghazi into a generic and contrived anti-Obama and anti-Hillary farce that no longer depends upon the facts. 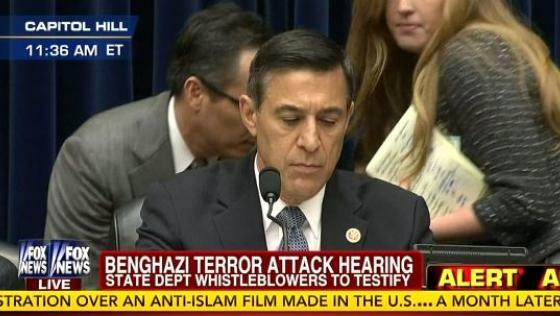 The endless hearings and expenditures of millions of tax dollars investigating the Benghazi raid (despite the fact that there are no real questions left) exist as pure partisan grandstanding, aimed at disparaging the current administration and harming the all-but-inevitable Hillary campaign in 2016. While the American people don’t have the power to shake the federal Republicans out of their Benghazi delirium, we do have the power to elect governors and state legislatures who will put the well-being of their constituents over partisan politics. Any governor who is currently blocking the Medicaid expansion must be removed from office and replaced with a Democrat or sane Republican who is willing to put our health over blind partisanship. Thank you once again, for a comparison that ‘should’ wake people up. Re-blogged to The New NY 23rd blog.